Having a goal isn't the same as aiming. I can desire good things, but if I don't aim for them, odds are, I won't reach them. 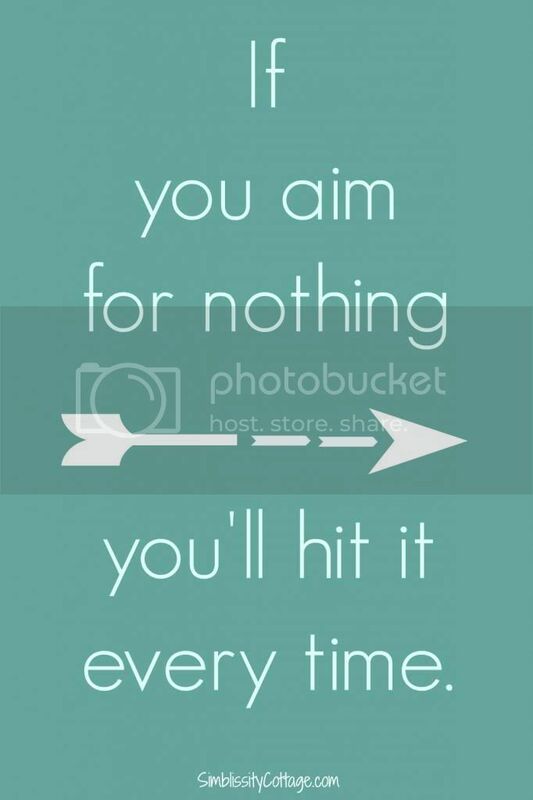 As Zig Ziglar famously said, "If you aim for nothing, you will hit it every time." And if you aim to misbehave? Well, that is still surely better than not aiming at all. In the early childhood years, the aim is often Survival. And rightly so. During the more rested, lucid moments, we may aspire for greater things, but those moments are rare and should not leave us with feelings of guilt when we have to fall back on the more immediate aim of being sure everyone is still breathing. I remember feeling guilty that we were surviving rather than thriving. I also remember being giddy with glee when I managed to sleep for 3 hours instead of 2 at a stretch. I failed to realize that surviving was a plenty ambitious goal for the stage we were in. Now I have a teenage son who is looking towards his future. His future likely involves leaving the nest in 2-3 years. Any aim I had now has a looming deadline. My baby girls will not be baby girls much longer. Though always my babies, they are approaching their preteen years. In a couple years, I will not have baby girls. The moments fly so fast, flying faster each year. What is my aim? Each year, Chris and I take a mini marriage retreat to evaluate where we are and refresh our goals. One question that we ask each year is, "If our family turned out well, what would it look like?" Each one knowing that we are all here for each other. I know that there is no controlling their final residency and that holidays at home is a bit ambitious, but it is my hope. The aim is creating a family bond that fosters a desire to come home. I don't want them to leave and not look back. I don't want them to dread trips home or think of it as an obligation. I want them to always know it as home. That is my aim. Now, how do we get there? Our weekend leaves us with lots of ideas. Often, they are the same ideas and decisions we've made the year before, but we underline them and write in, "Yes, but REALLY this time." Seeing how desperately fast the time is flying, my heart is screaming: REALLY. Aim and let the arrows fly before the targets are gone. Are we watching our tone when speaking to them? Are we being consistent with catechism? Are we being consistent with fun? Are we intentionally discussing our personal Bible studies in front of them? Are we being careful to get enough rest so we're not grumpy? Are we working in one-on-one moments with them? Are we protecting them (and ourselves) from too many distractions? Are we praying with them over the little things? Hopefully, after facing our progress or lack thereof week after week, our aim will improve. How is your aim? Some of you moms have been-there-done-that. I'd love to glean from your wisdom.